Homemade eyeshadow. You know, the all natural kind. This diy recipe has been long on my “to do” list. After giving you foundation, mascara, blush, and bronzer I knew I needed to provide a homemade eyeshadow recipe to round out all the other all natural makeup tutorials. And I won’t lie, I’m pretty stoked about this eye shadow recipe. Like my other makeup concoctions, this one is easy, adjustable, and subtle. It seems that whenever I post a makeup recipe I get two opposing reactions. On the one hand, you have the “Oh! I love it, it’s perfect, and thank you” people. These people make me smile. I appreciate your enthusiasm, and I’m happy the recipe worked for you. Of course, on the other hand, you have the “It didn’t work, I didn’t like it, it’s too _______.” Guess what? I still love these people, too. Often these people will go and tweak and find a solution that works for them. And when those people come back and tell us their tips and tricks we all win! Here’s the thing about ANY of my beauty recipes: Their success highly depends on a number of things including (but not limited to): Your skin type, environmental factors (like humidity, temperature, etc. ), your ingredients, and your preferences. I wish I could find a simple solution that worked for everyone… but I have yet to get my magic wand in the mail (even though I sent for it years ago!). Nope, all I can do is give you what worked for me and hopefully a starting point for your own exploration. Besides, exploring and experimentation is half the fun! Finally, be smart about how you make your own beauty products. You can read this post on some ways to make sure your homemade beauty products remain safe. But even beyond the basics, don’t forget common sense: If you’re allergic to any ingredient, DON’T USE IT! If something smells bad… throw it out. If you don’t like it, try something else. Let’s get on with the main event: All natural homemade eyeshadow!!! Oh yeah. 1. Start by placing 1/4 – 1/2 tsp. in a small bowl. 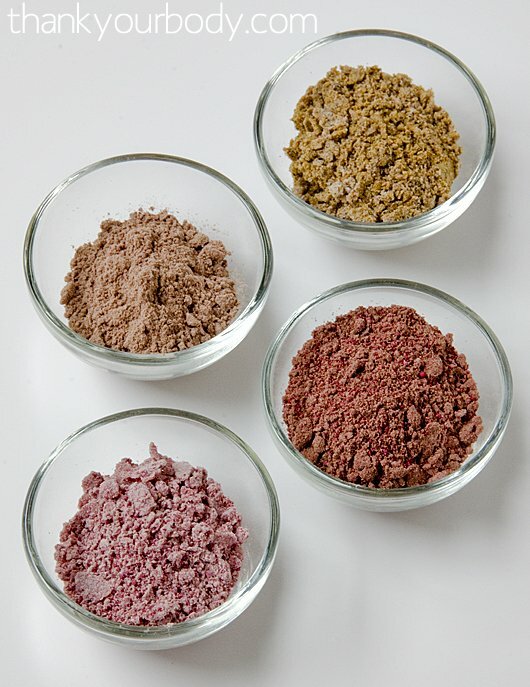 The more arrowroot powder you use the lighter and more subtle the color of your homemade eyeshadow will be. You can always add more, so start with less. 3. Once you have a well-mixed color, add in 1/4 – 1/2 tsp. of shea butter. Use the back of a small spoon to “cream” the butter in with the powder against the side of the bowl until you have a soft, creamy powder. (It really will still look mostly like a powder.) The shea butter will help keep this homemade eyeshadow on your lids and provide a nice moisturizing kick. *Since I know I’ll be asked for a substitution for arrowroot: You could probably use cornstarch, but I would highly recommend arrowroot because it’s a finer and lighter powder and less irritating in my experience. Tapioca flour might be another alternative. But experiment at your own risk. To use: use your finger tip or a small brush. Tap off any excess and gently wipe as you would other eyeshadow. What do you think? 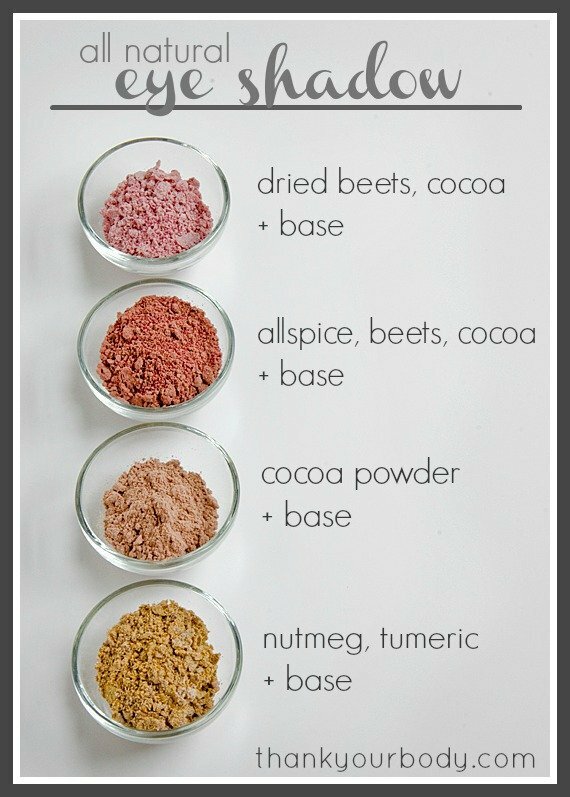 Have you tried making your own eyeshadow? Healthy or not? Pinterest lies and other foolish things.